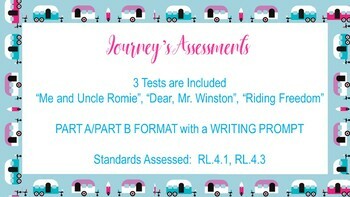 Assess students' knowledge of character traits by allowing them to choose among the following stories from 4th grade Journey's: "Me and Uncle Romie", "Riding Freedom", and "Dear, Mr. Winston". Each test includes 3 part A/B questions worth 7 points per test. A writing prompt is included to assess students' ability to describe a character in detail by focusing on a character's words and actions.